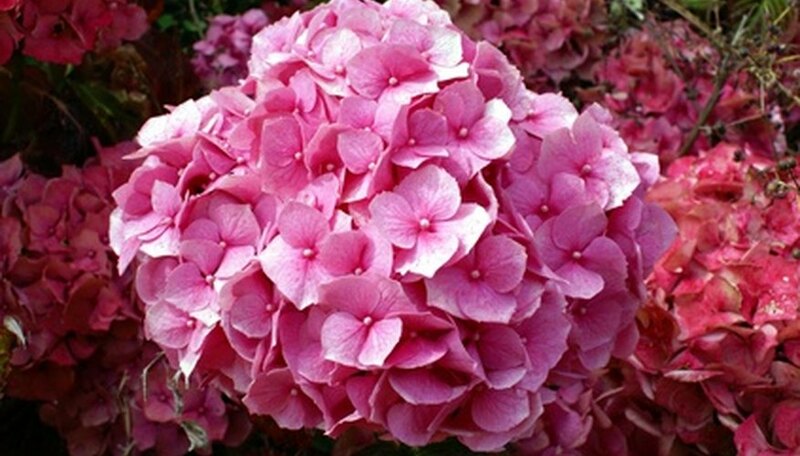 Over 100 varieties of hydrangea species and cultivars are currently available. Numerous hydrangeas offer cold hardiness and a few offer extended summertime blossoms. Hydrangeas are grown in tree forms that tower over 25 feet. Others are simple shrubs which attain a height of only 6 feet and a few varieties stay quit small at only 3 feet in height. Plant hydrangeas in full sunlight or partial shade. Full shade will cause the hydrangea to produce very few or no flowers each season. In areas where the afternoon temperature is exceptionally hot planting in partial shade is ideal. The plants enjoy well-draining soil. Add abundant organic matter to the soil when planting a hydrangea for the first time. Mulch around the plant to help keep weeds back, add nutrients and also maintain soil moisture. Hydrangeas are valued in the landscape for their abundant flower production. Soil conditions can dictate whether a few hydrangea varieties bloom in colors but other varieties produce white blooms only. Acidic soil conditions yield blue shades and alkaline soil produces pink flowers. Soil conditions can often be manipulated to change the plant's flowering colors. Adding iron sulfate or dolomite with lime will help the soil produce either blue or pink blossoms. Blooms appear from June to August. Buds of the hydrangea form on the previous year's wood. Due to the shrub's need to produce buds only on the previous year's growth, many hydrangeas fail to bloom because the wood suffers wintertime damage from heavy freezing or adverse conditions. Hydrangeas require little pruning. Only prune the shrub to remove dead, damaged wood, to improve air flow and maintain size when necessary. Care must be taken when pruning the plant in the spring not to remove an abundance of the previous year's wood or flower production will be poor or nonexistent. Prune the plant after the flowers have formed. A few varieties of hydrangea bloom on the new growth, so early spring pruning before growth begins is ideal. Fertilize the hydrangea in the early summer. Use a well balanced fertilizer such as a 10-10-10. Water the fertilizer completely into the soil around the plant. Apply 1 cup for a small shrub and then gradually increase the amount with the plant's size.